Aware of the health benefits of chia seeds, but unsure how to use them? Here are a handful of easy ways to sneak more into your everyday diet. 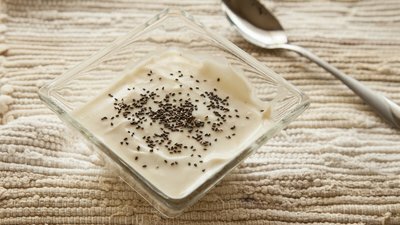 You may be well-versed in the benefits of chia seeds, but let's be honest; a spoonful of these tiny beads by themselves doesn't sound too appetizing. Don't worry, I agree. Try the following suggestions to make chia seeds an appetizing addition to your daily diet. For a dessert that won't blow up your physique, try making a chia pudding. Blend together 1/2 cup milk, 1/2 cup yogurt, 1 tablespoon cocoa powder, 2 teaspoons honey, 1 teaspoon vanilla extract, and 1/2 teaspoon cinnamon. Pour everything into a jar and stir in 3 tablespoons chia seed. Seal the jar shut, and let the mixture chill until thickened, about two hours. You can even add your favorite protein powder!